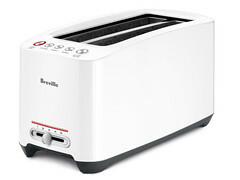 The BTA630XL ‘Lift & Look’™ Touch – Designed to make the perfect toast, the ‘Lift & Look’™ Tiouch fits up to 4 slices of regular bread up to 1.5″ think and two slices of long artisan bread up to 9.5″ long. The ‘A Bit More’™ button browns to perfection and the ‘Lift & Look’™ button lets you see just how done it is without interrupting or restarting the toasting cycle. 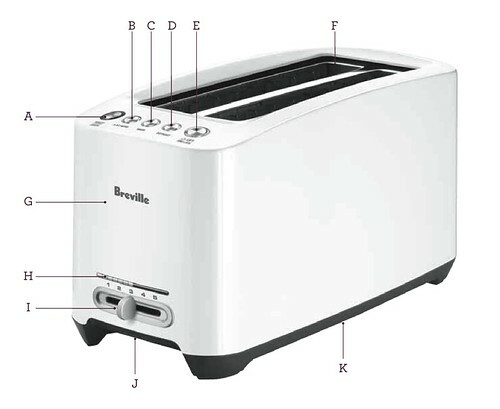 A. TOAST/CANCEL button with motorized raising and lowering, and toast ready sound alert. B. 'A BIT MORE'™ button. C. Bagel setting. D. Defrost setting. E. Motorized 'LIFT & LOOK'™ button. F. Long Toasting Slots extra wide with self centering carriage. G. Cool-touch body. H. LED toasting progress indicator. I. Variable browning control. J. Slide out crumb tray. K. Concealed cord storage.